The vervet monkey (Chlorocebus pygerythrus), or simply vervet, is an Old World monkey of the family Cercopithecidae. It is native to Africa. The term "vervet" is also used to refer to all the members of the genus Chlorocebus. 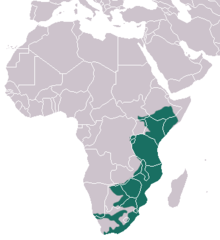 They are found mostly throughout Southern Africa, as well as some of the eastern countries. Vervets were introduced to the Americas, where there were originally no Old World monkeys. They are now in Florida, Texas, Alabama, Louisiana, Arizona, California, Ascension Island, Cape Verde, Barbados, Saint Kitts, Bermuda, Bahamas, Cuba, Jamaica, Haiti, Dominican Republic, and Nevis. Vervets are mostly herbivorous monkeys. They have black faces and grey body hair color, ranging in length from about 50 centimetres (20 in) for males to about 40 centimetres (16 in) for females. Vervet monkeys serve as a primate model for understanding genetic and social behaviors of humans. They have some human-like characteristics, such as hypertension, anxiety, and social and dependent alcohol use. Vervets live in social groups ranging from 10 to 70 individuals. Males change groups when they become sexually mature. The most significant studies done on vervet monkeys are on their their communication and alarm calls. Communication helps kin and group recognition, and alerting to predators. ↑ "vervet monkey". ZME Science. ↑ Palmour R. et al 1997. "Of monkeys and men: vervets and the genetics of human-like behaviors". Am. J. Hum. Genet. 61 (3): 481–488. doi:10.1086/515526. ↑ Pasternak, Graham et al 2013. "Population ecology of vervet monkey in a high latitude, semi-arid riparian woodland". Koedoe 55 (1). doi:10.4102/koedoe.v55i1.1078. http://www.koedoe.co.za/index.php/koedoe/article/view/1078. Retrieved 4 June 2014.